Beef rendang, a fragrant Indonesian curry, is made with skirt steak braised until tender in a richly spiced sauce of tomato paste, lemongrass, onion, garlic, ginger, and coconut milk. Can also be made in the slow cooker. 1. In a large Dutch oven with a tight-fitting lid over medium-high heat, warm 2 tablespoons oil. In a large bowl or resealable plastic bag, combine the flour, salt and pepper, seal, and shake. Add the beef and toss to evenly coat the beef. Working in batches, add the beef to the hot oil without crowding the pan and sear until browned on all sides, 5 to 6 minutes. Transfer the meat to a bowl. 2. Add the onions, garlic, lemongrass, chile, ginger, and additional oil, if needed, to the Dutch oven and cook, stirring frequently, until golden, about 5 minutes. 3. If making the beef rendang in the oven, preheat the oven to 300°F (150°C). Stir the tomato paste, spices, and sugar into the Dutch oven. Then add the coconut milk and 1 3/4 cups stock. Bring to a gentle simmer and then return the beef to the Dutch oven. Cover and slide it in the oven, stirring once, until the meat is very tender and the sauce clings to the beef, about 4 hours. If the beef is tender but the sauce hasn’t thickened to your liking, place the Dutch oven on the stove over medium heat, uncover, and simmer until the sauce reduces to the desired consistency. Season with the kecap manis and a generous squeeze of lime juice. If making the beef rendang in the slow-cooker, transfer the onion mixture to your slow cooker and then stir in the tomato paste, spices, sugar, coconut milk, and 1 cup of stock. Stir well, then add the beef. Cover with the lid and cook on the low setting for 7 hours. Pull the lid slightly ajar and cook on the high setting for a further 30 minutes. Transfer everything to a large skillet set over medium heat and reduce the sauce until it clings to the beef. Season with the kecap manis and a good squeeze of lime juice. 4. Remove the lemon grass stalks before garnishing with fresh cilantro. Serve with a side of rice. Instead of being simmered low and slow in the oven, this tasty curry can be made quickly in your pressure cooker or Instant Pot. Follow the slow cooker method above, using the Sauté function to brown the meat and aromatics. Cook on high pressure for 45 minutes and then let the pressure release naturally for 15 minutes. Remove the lid and use the Sauté function to reduce the sauce until it thickly coats the meat, about 5 minutes. Beef Rendang Recipe © 2018 Dean Edwards. Photo © 2018 Ria Osborne. All rights reserved. All recipes and photos used with permission of the publisher. This was a big hit for dinner time in our house! What a lovely combination of spice, heat, acidity, and creaminess! This beef redang on basmati rice was the highlight of my day! I opted to make this in the oven rather than the slow cooker. The meat was super tender after 4 hours. One thing I would recommend is giving it a little stir around after 3 to 3 1/2 hours just because some of the sauce does crust in the dutch oven. The sauce did not need to be reduced as it coated the meat as described. There is some chopping for prep, but all in all this is not too fussy of a dish. The worst part is the aroma from the oven torturing you as you are waiting 4 whole hours to eat this! Enjoyed the splash of lime juice for acidity and the sweetened soy sauce. 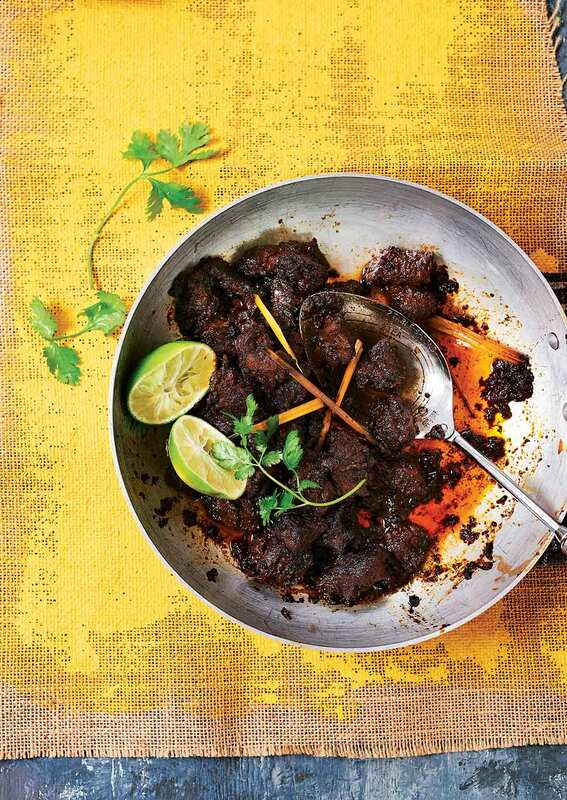 When you pull this beef rendang out of the oven, you’re offered an exact visual cue from the author’s description of the recipe. I served this with jasmine rice and offered kecap manis, cilantro, and sliced limes on the side. Everyone enjoyed adding flavors based on their personal preferences and this also sparked interesting table conversations. The rendang was delicious, exotic, not too spicy, and very much enjoyed by everyone! This was unbelievably delicious! Sweet, spicy, sour, and coated with an unctuous coconut milk sauce. I took a shot at making this in my 6-quart Instant Pot Pressure Cooker. The beef came out meltingly tender. The flavor was very balanced and well rounded. Even though the "instant" version took less than 90 minutes from start to finish, it felt like it had simmered all day. And that’s still quick, there’s only one pot to clean, and the result is great. A winner for sure! I followed the recipe exactly using 1 cup beef broth. I sautéed the onions and aromatics in the Instant Pot first and then added the beef to brown in two batches. I added the rest of the ingredients to the pot, stirring up the browned bits on the bottom, and once the sauce had come to a simmer, I set the timer for 45 minutes. There was more sauce and that I was expecting (no evaporation in the pressure cooker, of course!) and I could likely have reduced the coconut milk and the broth by 1/2 initially and still have had enough sauce to nicely coat the meat. Instead, I removed the meat and aromatics from the pot and switched back to saute to simmer the sauce down for another 5 minutes. This wasn't really necessary as the sauce is fantastic and it was nice to have a generous amount to spoon over rice. I find the pressure cooker intensifies spices and the cinnamon came through more that I was expecting. A nice surprise. I used a rather hot serrano pepper that I had left on the plant a little too long. I think you could go fairly hot here as the sweetness from the sweet soy, brown sugar, and coconut milk tempers the heat well. The sauce is really rich and good and, served with a flat bread for mopping or over rice, you could stretch this quite a ways. Dressed with fresh cilantro and lime wedges, this was aromatic and attractive. I served it over rice with quick pickled carrot shreds and cucumber slices on the side. This rich, saucy, slow-cooked beef rendang was a hit with my whole family. We were licking our plates clean! It was easy to make and nice to pop in the oven and forget about until dinner time. The finished beef was very tender. I found this recipe easy to make with instructions that were clear, concise, and easy to follow. The outcome was sweet and salty, the meat was incredibly tender, and the sauce coated the meat, creating a caramelized crust on the bottom. This was absolutely delicious. The only let down was that this recipe was described as being hot, this I do not agree with. Using only one chili really did not give it enough kick. The masala did add to the heat factor, but I personally would add more chili (maybe even garnish with fresh chopped chili). The recipe was very well received by my partner and guests and not a scrap was left on the plate. It was such a success that we tried it again a couple of days later. I discovered this recipe is very versatile and worked very well with mutton (which I used the second time round) and this was cooked in a Dutch oven. The results were just as mouth-watering and delicious as the first time. I would recommend this recipe to anyone who enjoys a curry and would like to try something other than the traditional Indian or Thai curry. Winner, winner, beef dinner! This dish is an umami bomb. So many flavors and tongue-tickling effects going on with each tender bite of the beef. (It was really hard to believe that this started with skirt steak because the meat fell apart like pot roast by the end of the braise but the beefy flavor of the skirt cut was clear.) The rich, mahogany sauce brought intense seasoning without being too much, making some plain jasmine or basmati rice a good foil for all the spice. At the end of the cook time, the meat and sauce were tender, falling-apart morsels of meat with just the right amount of very rich and thick sauce glazing the whole shebang. This was a winner through and through. Big, bold flavors developed to make a deep beautiful dish. One eater thought there may have been wine in the dish as it was so complex. We’re curry lovers at this house and we expect flavor. This delivered. 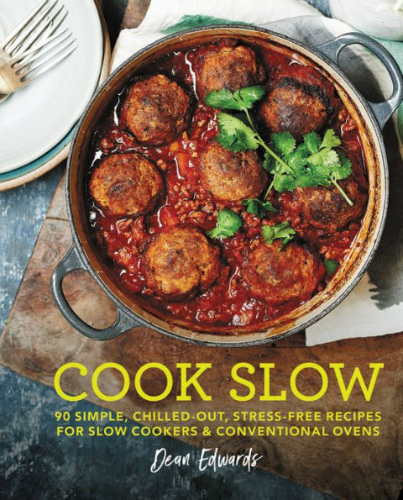 The slow cooker version is pretty simple and easily doubled (I confess, I tripled it!). At a casual curry-off in England, this recipe won. The ingredients are really key here, and I would not skimp. The recipe calls for olive oil to sear and I seared with ghee. As mine was done in batches, I probably had excess fat, that was easily skimmed off at the end of slow cooking. I will make this again with fresh naan!